Late summer and early fall can bring fireworks to your garden, pink spun sugar fireworks that catch everyone’s eye. 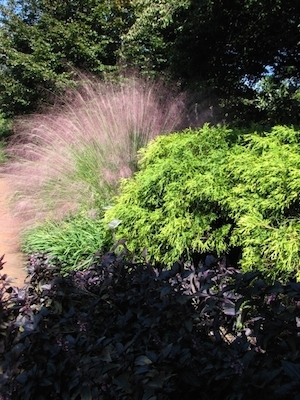 Pink muhly grass looks non-descript throughout most of its growing season. Its stiff grass blades are a medium green with serrated edges. It does have a slight fountain affect during the summer months. Late summer and early fall transforms this frog into a prince, or perhaps princess would be a better term. In a child’s garden, the soft pink clouds are sure to light up any little girl’s fantasyland of garden fairies and princess castles. Plant muhly grass in well draining soil in full sun for best color. It will grow four feet high by three feet wide. You can use it as a standalone focal point in a border or plant it as a hedge. It not only looks great in home gardens, a grouping will slow traffic in a commercial planting. To get it growing in its first year in the ground, water it every week if rain isn’t sufficient to wet the ground 2-3 inches below ground. Use your finger as a tester by sticking it into the ground near the roots. If it is moist, no watering needed. If not, then water until the ground has good moisture content. After that first year when you give it good attention, your muhly grass will be drought tolerant and only need water during extreme droughts. The only other maintenance this easy to grow grass requires is a haircut to the ground in late winter before the new green sprouts appear. After you trim it back, add a little fertilizer or compost in a circle around the base of the plant, being careful not to get any on the crown of the grass. Don’t mulch it. It is susceptible to root rot, really its only drawback in the landscape. If you have clay soil, you will have to amend it greatly to provide a free-draining growing environment. It often will bloom its first year in the ground. If you can bear to cut the plumes, they will make a welcome addition to a cut flower arrangement. You can also dry them by cutting before the seeds mature and hanging them upside down in a dark place. 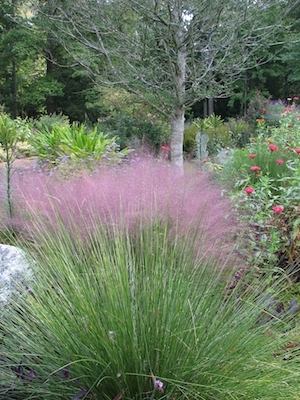 Pink muhly grass is a standout when everything else seems to be turning to red and gold.